It's another Monday. On every second and fourth Monday, I would be home and sleeping till just about 2 PM because I have no classes. Please don't ask about my other two Mondays. Those are horror stories of me getting stuck in traffic all morning. But this Monday was a little different from the other "off" Mondays; as my boyfriend calls it. If you've been a follower on my personal Twitter account, my Facebook account or on my Instagram account you would have been seeing a certain picture pop up all over. This, my dear readers is my beloved mirror that hangs above my hand basin. Or at least it USED to be there. I took this AFTER the whole story as below. Quote from my friend, Becca, who left this comment on my Instagram: I like how pooh bear is still smiling. Maybe that freaked those monkeys. So let me tell you my story. At about 7.30-ish this morning, I was STILL soundly sleeping because my alarm was only set at 8AM to wake my other half up. But my "sound" sleep didn't last too long and I heard this really loud crash from the direction of my toilet. Brilliant. For a while I was worried that it had been my wash basin that crashed because I remember how it NEARLY fell off once when I was putting on my contact lenses. And then there was this tiny part of me thinking it was a robber. A bit stupid considering how my toilet windows have grilles so there was no way that it was a robber. Still, I was a little scared so I decided to just take a peek into my toilet and I saw my mirror on the floor. Well, okay I just saw the twirly wired part of it but I knew that my mirror was down. And to my worst of nightmares, I found something so unexpected just sitting on my wash basin and staring straight at me while I examine what has happened. Three guesses for you there. Yes, do read my title. THERE WAS A BLOODY MONKEY IN THE TOILET, SITTING ON THE SINK AND STARING AT ME WHILE I FREAK OUT! And when I say monkey, I mean a REAL monkey. With fur, breathing and full of noise. Needless to say, I got the shock of my life and slammed my toilet door close. Immediately I sent my father a text message (Yes, we SMS each other. 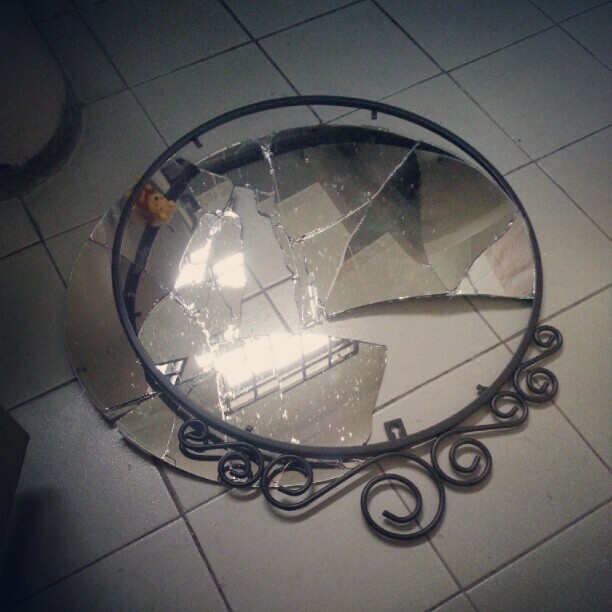 Thank you, Maxis for free calls and texts within the family plan) saying that I needed a new mirror because a bloody monkey came into the toilet and threw my mirror on the floor. I take it that great ball of fur threw it down when it saw its own reflection but my mum reckons it just kicked off my mirror while having its own party. It really just reminded me of times when my grandfather spent 6 months living with his when he was unwell and put his whole heart into growing just that ONE tomato. I remember how excited he was the night before saying, "We'll pluck it off tomorrow because then it would be really red, juicy and sweet which means it is ready." but was only greeted with an empty plant the next morning. Also greeting him was a cheeky monkey holding on to my grandfather's piece of work while sitting on top of our house gate. Boy, was my grandfather pissed. I think he was a lot more disappointed to angry. That would have been an amazing tomato. My grandfather used to say that maybe if we ever catch the monkey we'd give it a mohawk haircut while giving its fur a good dip dye with rainbow colors. And when we're done, we'll release it back in the wild and have its clan exile him for being so weird. Ha! I'm kidding. No, really. I would love to do that. Yes, I spent a whole post just babbling away about my broken mirror and that stupid monkey. I hope the monkey gets 7 years of bad luck! That will teach it for having a party in my toilet! And for waking me up early in the morning on my "off" Mondays. And such is my monkey business.